Yesterday’s trip to our local, Le Chatelain, was a welcome reprieve, and I took the opportunity to sample a new beer, Floreffe Blond. Hard to believe I haven’t had everything on offer there yet, but that’s Belgian pubs for you: even a run-of-the-mill one will have 30 or so types. Le Châtelain probably has closer to 60. 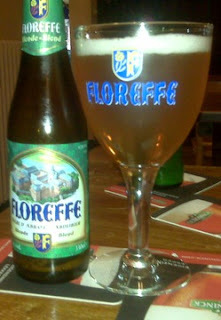 Floreffe’s dark beers, Floreffe Dubbel and Floreffe Prima Melior, are included in my list of top ten Belgian beers, so I was expecting great things with Floreffe Blond. I wasn’t disappointed. Floreffe Blond is lighter than normal strong blond ales. It’s lemony, summery. Fiona says it’s smooth and has a bubble gum taste -- “that powdery, old-style bubble gum” -- but I’m sticking with citrus. It has very little bitterness, but it’s not sweet. At 6.3% alcohol, it’s not too brain-bending either. Which is just as well, because the wood treatment is doing my head in plenty enough.